REV Drill HDH series w/ down hole hammer set-up. REV Drills are high performance drill rigs that easily mount to your excavator utilizing the existing hydraulics and controls. At a fraction of the cost of most specialty drill rigs, REV Drills can be used with your existing excavator, increasing productivity and revenue with one machine. REV Drills are manufactured in the USA with high quality drive motors and winches, making REV Drills dependable, easy to operate, and capable of performing strong day after day, on various applications. In under 40 minutes REV Drills can be mounted on your excavator, ready to drill. 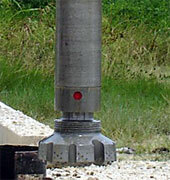 REV Drills are capable of aggressively drilling rock with "down hole hammer" tooling. REV Drill's applications also include foundation piers, sound barrier walls, beam retaining walls, tie-backs, pre-drilling pilings, shoring piling, rock drilling, blast hole drilling, helical anchors, tie-downs, bracket piles, perc testing, etc. The REV Drill was developed from 25 years of Foundation Engineering and Construction Experience as a Revolutionary approach to drilling. REV Drills are uniquely designed to be attached to most hydraulic excavators, utilizing the bucket and one auxiliary circuit. REV Drills are self erecting, and allow quick change over between digging and drilling, 45 minutes or less. Operation of the drill is simple with the crowd / retract running off the auxiliary circuit and the drill forward / reverse running on the bucket circuit. Developed originally as an earth drill, the REV Drill can be readily adapted to tieback drilling, rock drilling, de-watering, auger-cast, and many other applications. REV Drills are lightweight, but built heavy duty; each one configured to customer specifications. At REV Drill our experience will help you gain the edge by providing Economical and Versatile equipment, and the know-how, to help bring a Revolution to your drilling. The foundation of REV Drill is Economics. The purchase cost of most specialty drill rigs is staggering and their applications tend to be very specific . For example, you commit $500,000 or more to a specialty drill rig; can you keep that drill busy enough to pay for itself? Contract drillers, when available, reflect the cost of their equipment. Delays and unforeseen conditions often drive the final cost skyward. REV Drill is the answer. With REV Drills you can bring the cost down to a fraction of what you have been paying, and when you are finished, lay it down and go on to other work with the excavator. The cost of a REV Drill and excavator is a fraction of what you would pay for a single function specialty drill rig. (If you own an excavator that is even better). The key to success in today's market is Versatility. This is an area where REV Drill stands above the crowd. REV Drill applications include the foundation piers, sound barrier piers, beam retaining walls, tie-backs, pre-drilling piling, shoring piling, rock drilling, blast hole drilling, helical anchors, tie-downs, de-watering, bracket piles, perc testing, investigation, etc... Let your imagination be your guide. At REV Drill we pride ourselves in building quality American built and designed products in a variety of sizes and configurations to suit your specific needs. When your needs change, we can modify your machine to do many different types of work and REV Drills are easy to mobilize, setup and operate. At REV Drill, we are experienced in a wide variety of drilling applications and conditions, and are here to serve you. Our experience will help you gain the edge by providing Revolutionary and Economical equipment, and the know-how, to help you bring Versatility to your drilling. * With 5 FT Extension, auger height and/or double Kelly Bar. All direct sale base units include boom mounting brackets for vertical drilling & mast hoses & brackets - customer responsible for excavator to mast hydraulics. All REV Drills are designed so that applications change can be done with minimal change to the base drill. For example, all drills have hollow core motor for top swivel, removable motor sled, and removable guides. This is a REV Drill exclusive, planning ahead for your future needs. Above specifications are for conventional short auger drilling. Specifications for soil nailing, tie-backs, continuous flight auger, down hold hammer rock drilling, large hole drilling, and many other applications are available upon request.